AMD demonstrated just how capable its Ryzen 3000-series CPUs are at CES 2019, wiping the floor with Intel’s flagship Core i9 9900K during a live Cinebench benchmark. And while this chip outpaced Intel’s top mainstream chip with ease, outperforming it massively per watt, rumour has it that AMD purposefully limited the engineering sample’s performance. AMD will soon have process node advantage over its long-standing rivals, Intel. The company is shifting over to the 7nm process node produced by TSMC, while Chipzilla has just about got its head around 10nm and will be rolling that out by the end of 2019. At least for the better half of a year or so, AMD will be well ahead of the game. Keen to show off how this technological advancement will push AMD over the leading edge, it set an eight-core engineering sample loose on Intel’s i9 9900K live on stage at CES. While the the Ryzen’s result was nothing spectacular, it matched the i9 9900K’s score with some 47W less power consumption. But there may yet be greater performance lying dormant in the silicon. According to a source speaking directly with AMD – reported by hardware YouTuber DannyzPlay – the engineering sample used live on stage was power limited by 30-40%. That doesn’t necessarily mean an equal boost to performance with an unfettered chip – power/performance do not scale in tandem forever – but it could imply some performance has been purposefully left on the table by AMD. Of course, that’s all subject to whether this rumour proves true or not. Grab your salt, etc. But carefully balancing the AMD chip to rattle Intel’s dominance isn’t a bad play by any means. Managing the power to almost exactly match the performance of Intel’s chip allows AMD to demonstrate the meaningful drop in power consumption afforded to it by the 7nm process. Whereas the performance gained by an unfettered chip without restriction would likely not have been quite so drastic. AMD’s Ryzen 3000-series managed 2,057 in Cinebench R15, while the i9 9900K scored 2,040. Roughly analogous scores. Yet, while the i9 9900K required 180 watts to get there, AMD’s engineering sample managed to make do with just 133 watts. Also briefly revisited in the video was the rumour that AMD wouldn’t necessarily support all B350 motherboards with the upcoming Ryzen 3000 bios update. This was similarly rumoured a few months back due to BIOS memory limitations. But, again, we’ll have to wait and see once board partners start rolling out updates to ratify the legitimacy of this one. It’s suspected, if at all true whatsoever, that 3rd gen support may be up to motherboard manufacturer’s discretion on the 300-series chipset. 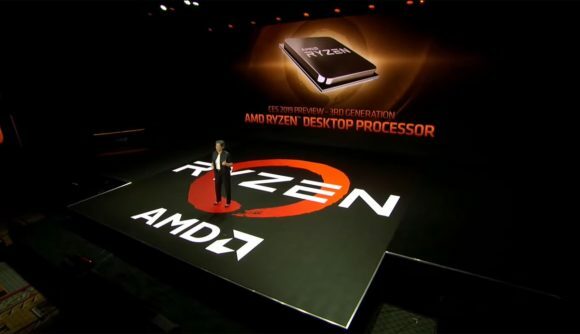 AMD Ryzen 3000 CPUs are expected mid-year. The rumour mill, as it stands, has earmarked July 7, 2019 for the announcement (7/7… 7nm… geddit? ), although we also don’t expect Computex to fly by without mention this year.